The International Campaign to Ban Landmines of which the Australian Network is a part is an action for peace. It has arisen out of the need and suffering of thousands of men, women and children, combatants and civilians, who are victims and survivors of antipersonnel landmines (APMs). It is a compassionate response, one based also on ethical conviction and strong political will to bring about change for a safer and more peaceful world – it is a response that has needed sound strategies for action on the local, national and international level. Australia signed the “Ottawa” Convention prohibiting the use, production, transfer and stockpiling of mines and their destruction – in December 1997. The ratification process was interrupted by the calling of an election just before the Bill for the required legislation was tabled at the end of August 1998. We are now waiting for the new Parliament to ratify this signature. 130 countries have signed this Convention, 41 have already ratified it, so that it will enter into force 1 March 1999. They are indiscriminate weapons, victim-activated, unable to discriminate between combatants and civilians; they remain active long after hostilities have ceased, and cause terrible injuries, physical and psychological suffering, prolonged poverty for families and communities, and delayed development and environmental problems for affected countries. We would say they are indiscriminate weapons used indiscriminately, and causing excessive harm far outweighing any short term military gain. Hence we would deem them illegitimate weapons of war under the Geneva Conventions of 1949 and the Additional Protocols. As such, they should be prohibited. With publicity, information is becoming more accurate. There are an estimated 80-100 million of antipersonnel landmines in the ground, millions still in stock; some 26,000 people are killed or maimed each year, many of them children; thousands of hectares of good agricultural land are mined; clearance is dangerous, slow and expensive. Rehabilitation is also slow and expensive. Some 62 countries have a problem with landmines (some researchers say 95 countries). Some countries such as the United States, Russia, China, India, Pakistan, Israel, Iraq, Papua New Guinea, and Singapore, have resisted a total ban. Some, such as China and Singapore have a moratorium on transfers; some, such as the US and China, still have large stocks; some, such as Myanmar ⁄ Burma and Serbia are reported to be still using mines. In all, this is a global problem requiring a global solution. When the Campaign was formalised in Australia in 1993 the Australian Government regarded landmines according to the prevailing military doctrine; they were legitimate weapons of defence; they were cheap, efficient and deemed necessary in our arsenal. In 1996 the Coalition Government undertook a review and came out in support of a total ban with suspension of all operational use of APMs, except in ‘extreme circumstances’. It was a compromise position – better than the previous position, but not really satisfactory to anyone, least of all to Tun Cliannaretli and those threatened by mines. The Government supported negotiations in the Conference on Disarmament, and gave the impression of great ambivalence about the Ottawa Process – the message Brussels in June 1997 was of a certain ethical and political confusion. After the Oslo negotiations of a text for a ban treaty, the government undertook another extensive review of policy, and after long and hard debate, decided to sign the new Convention. I believe that, whatever deals were done internally, the Government was confident of the support of the Australian public. The Campaign had presented 219,000 signatures to Parliament in September 1995, and had collected another 30,000 in the weeks following. The development and process of change in Australia’s landmine policy over the 5 years taught me this: a mainly humanitarian issue, by being treated as mainly a legal and military matter could become highly politicised and any moral imperative could be in danger of being lost in the relationships between departments, parties and even personalities. On the international level, the issue could become the subject of trade-offs for leverage. Just because of tin’s dynamic, it was important for the Campaign to keep in sight the long-term suffering of affected men, women and children, and the ethical principles at the base of political decisions. The Campaign for a total ban on APMs became a cutting edge of policy based on humanitarian and ethical principles, on a long-term vision of the common good of nations and a desire for a safer world for all the people. It has become a civil partner to governments working lo overcome the tenor and brutalising effects of the continued use of antipersonnel mines which have become more terrible and cruel in their modem forms and use. The new Convention will need to be well implemented if we are to see a reduction in the number of casualties from mines, and a significant increase in the land cleared of mines and returned to the people. The Convention relies on a voluntary sharing of information among the Slates Parties, on annual consultations, and on the good will of States Parties to engage with one another with transparency. The ICBL lias just established the Landmine Monitor – a civilian system of monitoring the implementation of the Convention, and of gathering the data which will help me international community to assess more accurately the scope of the problem, the resources needed and the means of putting.in place effective programmes of integrated rehabilitation for survivors and their communities. All this has been, and is, a test of our capacity for peace. It calls us to the long-term commitment to data collection on mine victims, continuing casualties from continuing use, mined areas, land cleared of mines, rehabilitation programmes, health services for victims, funds promised and allocated, effectiveness of our action. It is a call to continuing advocacy and to be building part of the truly just social order needed for peace. So, what is our capacity for peace? What is our capacity for building peace among us? As Sister Denise Coghlan said at the South East Asian Regional Meeting -we need to be clearing the mines from our land, but more, we need to be clearing the mines from our hearts. Acting for peace, as hundreds of thousands of Australians have in their support for a total ban on antipersonnel landmines, is just this ‘clearing the mines from our hearts’. The Campaign has affirmed and increased our capacity for building peace. In this work for a total ban on antipersonnel landmines the NGOs have been a driving force. They have been the voice of civil society speaking and being heard by governments on behalf of people, and in this case, people who till recently have not had a voice that has been heard by the decision makers. I remember well Tun Channareth and Chreung, both-double amputees from Cambodia, manoeuvring their wheelchairs in front of the diplomats’ cars arriving at the UN Review Conference and handing the delegates a flower with the petition for a total ban. I also remember the stunning simplicity of Tun Channareth when the Review failed to call for a total ban. H e said very quietly ‘It is very hard for me to have no legs. I want to save my children from the danger of landmines. I am very disappointed that the conference has not supported a total ban.’ – a devastating simplicity, which moved many to say “There must be another way!” This may have been the germination of the Ottawa Process. This is what Johan Galtun has called The Third System – governments and nongovernment, civil, society working together, with the best of its expertise, counsel, governance and government for the good of the people. We all need to be engaged in this, each in our own way, with our own capacity. The Landmine Monitor will be way another instance of civil society assisting in an integral way with the work of building our peace together. Like all such initiatives it will require skill and expertise, but mostly generosity – from governments to help with finance, from citizens who can and will give of their time and talents to ensure that we do the best we can to address this global problem with effective solutions – for our people, and for our next generation. The continuing campaign challenges us all to greater and greater compassion, greater moral courage to take the small actions for justice that are the foundation stones of peace. So we can be peaceable people building a better future together – this is but one issue, one problem we can address together as small groups, organisations, nations and as an international community – there are many issues and problems that call for a response, and we do what we can from where we are. For me it has been advocacy for a total ban; for Modechai on the edge of the jungle on the Thai-Burma border it is making artificial limbs for his neighbours who have lost limbs to landmines. For John it has been making photographic exhibitions to expose the terrible situation in mine affected countries. Bernard writes songs, Judith leaches international law, Bruce researches the impact of mines, Mary collects signatures for a ban, Maureen talks to her friends about the problem. For Chris it was to use his skills as a de-miner, now it is to be an advocate for victims of mines. For some it is to give financial support. We can go on enumerating the marvellous small and large contributions from the supporters of the Campaign to ban landmines. Indeed, this is “clearing the mines from our hearts”, and it is building our capacity for peace. 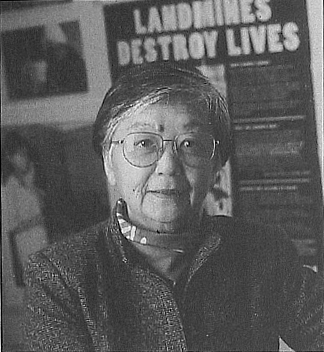 Sr Patricia Pak Poy is the National Coordinator of the Australian Network of the International Campaign to Ban Land Mines. She began the Australian Network as a response to the problem of landmines as she met it when she was working with the Jesuit and Mercy Refugee Services in Thailand in 1990. Currently she serves on the Government National Consultative Committee on Peace and Disarmament, the Education and Advocacy Committee of Caritas Australia and Hie Adelaide Diocesian Finance Council. In 1998, she was awarded the RSL ANZAC Peace Prize, and was also appointed Member of the Order of Australia for her work on international understanding, especially through the Australian Network of the International Campaign to Ban Land Mines. These awards recognise the significance of the landmines issue and the work of the Campaign.